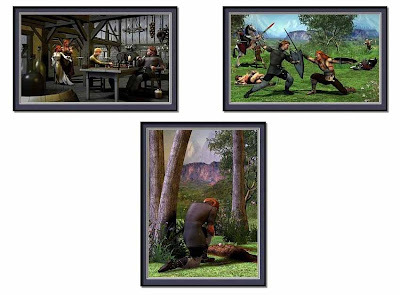 The Aldric & Anneliese triptych is available through my ImageKind gallery. 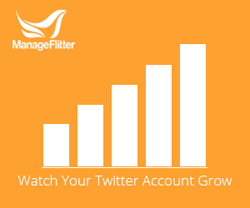 Don't ya just love a great critique, review, or testimonial? Whether you are an illustrator/artist, or author, the pride induced when someone takes the time to send you an email, or post a comment, with positive things to say about the work you've dedicated yourself to, just makes your day. It makes all those long hours (usually riddled with just as much frustration as joy due to edits & revisions) seem worth it. Three prints from ImageKind arrived. Maybe it's just me, though I sorta doubt it, but I tend to get a touch nervous that a work won't be liked. I'm always a little afraid to find out what the receiver thinks. At the same time, I can't stop looking in my inbox for any feedback. 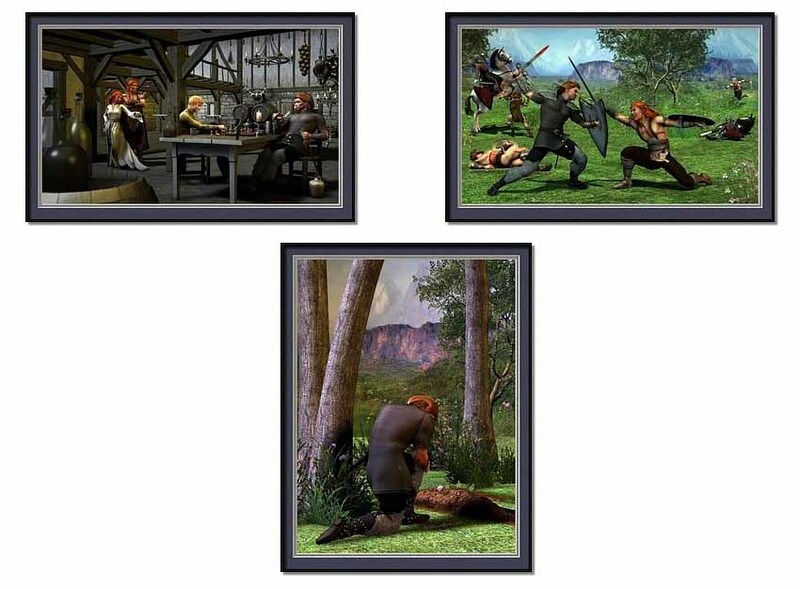 Although I knew Harry liked the images in his trailer (see below), I wasn't sure he'd feel the same about the fine art Giclées he ordered for his home. 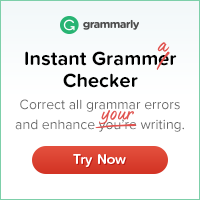 After all, I had only read about ImageKind's quality. Having just recently started using their service to sell my art in framed and matted prints or canvases, I hadn't had the personal opportunity to see my work printed through them. Normally, I would have done a quality check before offering a new product or service, but it just didn't work out that way. Harry was faster to buy than I was. Of course, ImageKind has a 30 day money back guarantee, so I wasn't worried he'd be out much if they turned our poorly, but I would have been very upset at having being the one who endorsed them by attaching my work to them. When the print prices range from $95 to $400 per piece, depending on the matting and frame or canvas, not to mention size chosen, you want the customer happy ... lol. The three framed prints I ordered from Imagekind arrived this morning. I love them! They are extremely sharp and clear and high quality. The prints themselves, the mats, and the frames are all very nicely done. They were packaged extremely well to protect them in transit. Everything was/is first-class. And I truly enjoy looking up from my computer where I am writing to see these pictures of the characters from my own book. I am well pleased. Hey, the trailer for A&A has some 215 hits at present. Great exposure! Wasn't that so sweet of him? To not only take the time to let me know they arrived safe, but how he feels seeing them where he writes. He even lets me know how the book trailer I created for him is doing. He is such a nice author, and I just loved the story. I hope he does a sequel ... *hint-hint, Harry* ... lol. Let's add a few more hits to his trailer, for him, and be sure to check out Harry Gilleland's blog, and order your copy of Aldic & Anneliese from 4RV Publishing today! If I understand correctly, it's even going to be available as an eBook, soon. If you'd like to have one of the prints for your home, check out the latest blog post featuring them, along with product details and where to purchase them, or simply visit my ImageKind gallery. I'm glad Harry liked the prints. They look great on a computer screen. 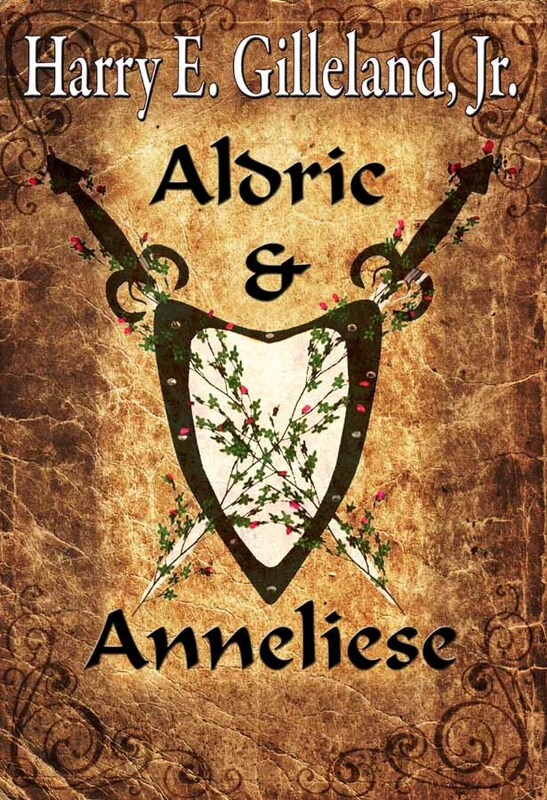 Yes, as soon as we receive the formatted file, Aldric & Anneliese will be available as an eBook through Kindle and Nook. Take Apart Their Nightmares in Scape Magazine! Walking Through Walls book trailer.